Allison Regan, played by Britne Oldford, is a part of the Exo-Terrorism Unit, which hunts alien invaders in Syfy's new series "Hunters." A secret government group fights infiltrating aliens in Syfy Channel's gritty, gory new show "Hunters," which premieres tonight (April 11) at 10 p.m. EDT. The show comes from executive producers Gale Anne Hurd, executive producer on "The Walking Dead and the "Terminator" trilogy, and Natalie Chaidez, an executive producer for "12 Monkeys," "Heroes" and "Terminator: The Sarah Connor Chronicles." 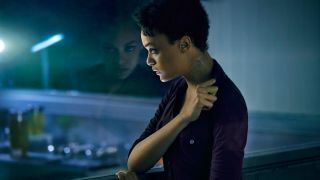 The show's premise echoes the real world's current terrorism-hunting political climate, but the series promises intriguing science fiction elements as well: out-of-this-world action sequences, gory alien autopsies and intrigue, including — according to Syfy's promotional material — a Hunter working against its own kind to try to save humanity. So, for thrill-seekers and science fiction fans, plus anyone who likes really out-there special effects, "Hunters" should be worth a look tonight.